South West Fitted Kitchens LTD - No1 For Your Next Kitchen. Premium Quality Kitchens, at affordable prices, from a company You Can Trust for great service with a personal touch. "Ray is an absolute perfectionist and is full of great ideas"
"you will never get the installation and quality of his products from the national kitchen companies"
"We really appreciated the time he spent listening to us and planning the whole thing"
"The cleverness of the design has resulted in an arrangement that not only looks terrific but works exactly as we wanted"
"Ray came highly recommended to us and we were delighted with the job he did"
"His attention to detail is second to none and I would not hesitate to recommend him to anyone"
"Ray installed our fitted kitchen, bedroom and en-suite bathroom furniture"
No1 For Your Next Kitchen, Bedroom, Bathroom & Office. We do not have an expensive showroom with sales people that we would expect you to visit! By making good use of the internet and visiting our clients in their own homes, we are able to keep our overhead costs to a minimum allowing us to offer our Kitchens, Bedrooms, Bathrooms, and Offices to our clients at very competitive prices. Ray & Jayne Brock, Directors. We provide a free consultation at your home, to fit in with your schedule and ours. To enable us to work well together we need to be aware of your budget. We have many doors and worktop samples to cover all price ranges and tastes and this allows us to bring the best samples to fit within your price range. We then spend time with you to discuss your requirements and time frame. We look at your ideas of what you want and we are happy to give you any design ideas we may have of what is available to fit in with your requirements. Why not pick up the phone and ring South West Fitted Kitchens LTD on 01237 421112 to book an appointment to find out how we are able to help you? Please allow us to explain how we can help you. A popular market is with those who have a limited budget. What we will say is, that clients we have worked with in the past have been surprised that their budget, which they thought would only allow them to get a low priced kitchen from a local DIY chain, would, in fact, allow them to get a better quality Kitchen through us, with a personal service and a much greater choice? The DIY chains offer discounted, poor quality Kitchens with cheap or free?? appliances but they can still sting you on the fitting and accessories, so what really matters is the final, installed price. If you have a healthy budget, for your next Kitchen, we can help you to not only get your dream Kitchen but also allow your £££’s to go much further. So what should you do now? Either Ring 01237 421112 for further information or to arrange a visit to your home. 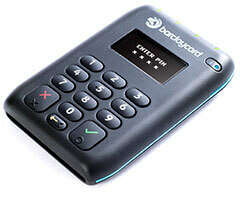 We are pleased to announce that we are now able to offer a card reader facility and can take payments by Visa or MasterCard. I am just writing to say how delighted I am with my Kitchen! The design you came up with works really well and uses all the available space to good effect! A special mention must go to the excellent corner tall larder unit that is a joy to use. You were very professional throughout the whole job from the coming up with a good Design, to sourcing the right Kitchen supplier to making a great job of the installation and I would highly recommend your services! We are able to help you with any style of Kitchen you desire. Below is a list of the many popular types of Kitchens there are out there to choose from. We’re writing to express our gratitude for the excellent work you did for us, installing our new kitchen, bedroom and en-suite bathroom. We’re absolutely delighted with the finished result, a tribute to your craftsmanship and attention to detail. You interpreted our requirements very precisely, including making excellent suggestions on how to get the very best from our investment. 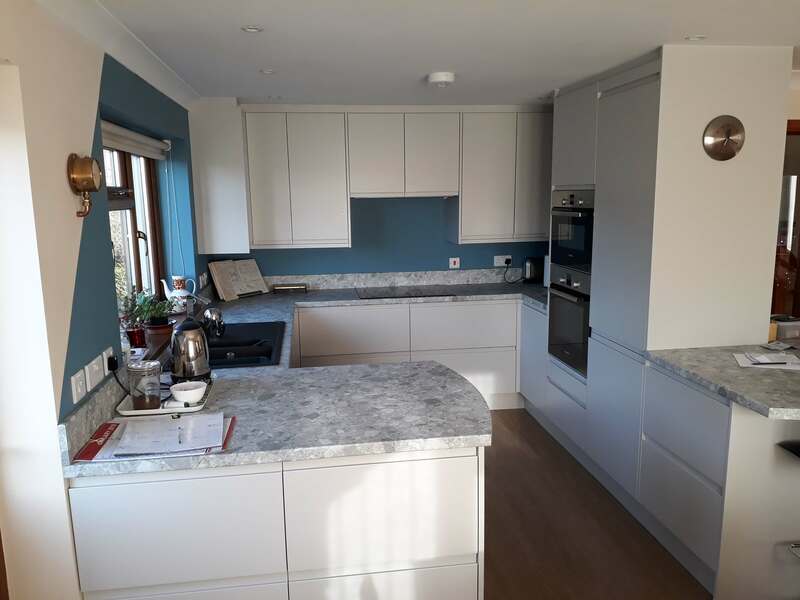 Your sheer professionalism made it an absolute pleasure working with you on this project and we have no hesitation in recommending you and South West Fitted Kitchens to our friends and colleagues in the future. John and Pam Duckett, Sticklepath, Barnstaple, North Devon. be able to make the right choices? Why not let us take that burden away from you by using our knowledge of being at the sharp end!! When people find out what industry Ray is in they often ask if he could recommend to them a good Kitchen company! After looking into this and researching what people wanted, Ray decided to provide quality Kitchens, Bedrooms, Bathrooms and Offices! The company I use are quite local and because they supply other Kitchen retailers they are able to buy their raw materials in a lot cheaper than I could buy them myself using the economies of scale meaning I can buy them in cheaper than I could produce myself. This now keeps my overheads down. I do not need large units along with the staff to run them allowing us to be very competitive with the large chain stores, but with a much more personal service which my past clients have enjoyed. We just wanted to write a few words to thank you for our lovely Kitchen. You managed to design a lot into our kitchen using up all the available space. The extra tall wall units have given us so much more storage. You did a great job of the fitting and the Kitchen company that you recommended to supply the Kitchen were good as well. We would recommend South West Fitted Kitchens to anyone and we already have someone who will be ringing you soon. Paul and Sharon Blackmore. Westward Ho! North Devon.